Bon Odori is a traditional Japanese dance performed during Obon. Obon is like Japanese Halloween. People believe that during this time the spirits of their departed loved ones come back to earth and revisit their household altars. Hence, families go back to their hometown to visit and clean their ancestral graves. Obon is observed from the 13th to the 15th day of the seventh month of the year. Based on the solar calendar, the seventh month falls in July. However, since Japanese later on followed the lunar calendar, this month coincides with August. Majority of the regions in Japan celebrate Obon is mid August while a few celebrate in July. As one of the three major holiday seasons, travelling within Japan during this time is a nightmare. Influx of locals crowd the trains and airports to get to their hometowns. That is why my husband and I decided to stay in Tokyo. We celebrated Obon by going to a festival near our place. One of my students invited to the festival or matsuri organized by the homeowners association where she lives. Together with some friends, we went there by bike which took us about half an hour. 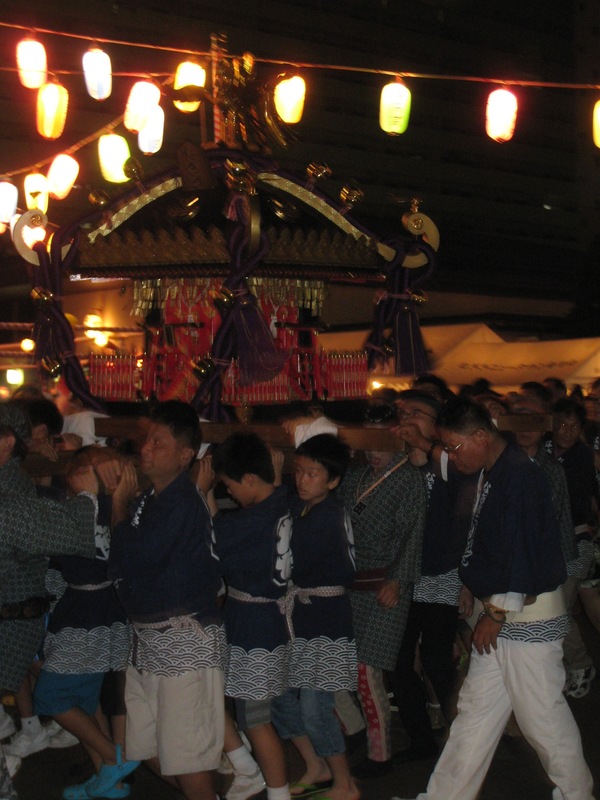 The matsuri was held in the open ground decorated with lanterns and a stage in the middle. Around it were stalls and tables selling different food and toys. There were also some tables and chairs where people can relax and watch drum performances and ladies dancing the Bon Odori while enjoying some takoyaki, yakitori, or beer. Some families put mats on the ground to have some picnic. Although I had been to several Bon Odori, I am always excited with its festive scene. The kids and ladies perform the Bon Odori wearing beautiful yukata or summer kimono. The big drums fill the air with traditional Japanese festival music. And the smell from the food stalls invites the people to lavish on some delicious Japanese street food.